Variation is any alteration made to the scope of works in a construction contract. These variations will require approval may it be in the form of addition, subtraction, substitution or omission. Variation Report allows you to approve and reject submitted variations through notices that will affect the payment claim system as well. Note: Make sure you have allowed Variation Report on the User Access page. From your navigation bar, go to Management > Reports > Variation Report. Or type in 'Variation Report' on the search bar in the upper right corner of your portal. From your project page, click Create on Payment Claim System tile then click the Variation Report button that is displayed on your PCS Dashboard. 2. The Variation Report page will be displayed. By default, it shows variation to contract works of all projects made through notices form. 3. Click the Download button to download the displayed table. 4. Click Email Reports if you want user(s) to receive the variation report on their email(s). To learn more about this feature, click here. All your submitted notices of variation to contract works will appear on this tab. 1. Click Approve on the variation that you would like to update and/or approve. 2. Variation Summary will show. You can update your variation's Description and Increase in Price here. 3. 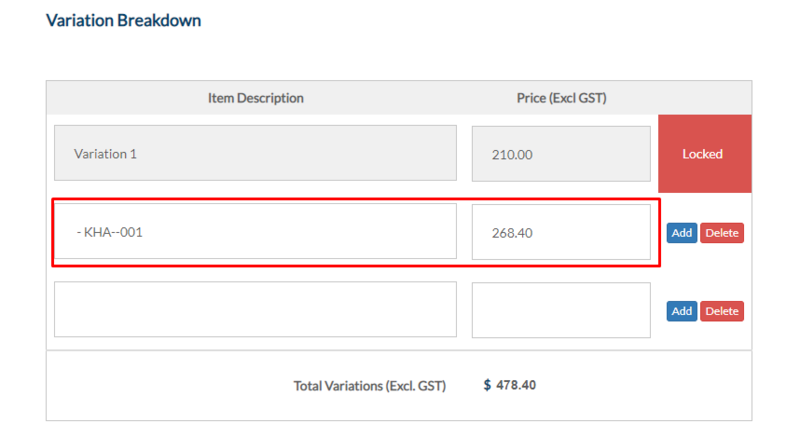 Click Show Margin to update builder's margin's Increase in Price or Decrease in Price. 4. Your total variation price would be computed automatically. You can see it on Variation Total (Incl. of GST). 5. Once you're sure of the Variation Summary, click Approve. 6. A message will be displayed confirming your approval. Click Thanks to close the message. 7. Your variation will be moved from For Approval tab to Approved Variations tab. 8. Your variation will also be added to the Variation Breakdown in your project breakdown page. 1. Click Not Approve to reject variation. 2. Click OK to confirm. 3. A message will be displayed confirming your approval. Click Thanks to close the message. 4. Your variation will be moved from For Approval tab to Not Approved Variations tab.